The band describes themselves as “Power Metal band”. Of course ! We’re talking about “Pharaohs”. They want to produce high-quality, true heavy metal. 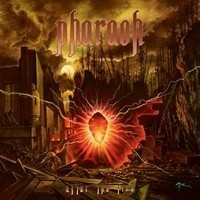 The album also positioned PHARAOH as one of the most promising and classy melodic metal bands in recent memory, earning the band much-deserved praise both on domestic and international shore, and they really deserve it. As their inspiration comes from SAXON, IRON MAIDEN and other bands as RAGE and ANGRA, we can be sure they do their best to offer a lot of quality in their music. This album offers a great sound, referring to other bands, but does not look like a “déjà-vu” because the band plays old-style music with modern power and energy. The songs are all different, but offer a common epic tone. “Unum / After The Fire” and “Flash Of The Dark” offer a nice contrast as the first one begins with a powerful opening, and the other one, with an acoustic guitar. But both are dynamic songs with lightning-like guitar tones and a powerful voice. A good way to open the album. “Forever Free” Cooler song. This ballad contains great parts of guitar play, with a clear and powerful voice, but with a Rock N Roll ending, making a good link with “Heart Of The Enemy," that begins with a cooler intro, turning into a good Rock song, with epic singing and loud guitar, inviting as well, with great guitar solo And with a nice smooth ending. ”Solar Flight" is a song with a dynamic opening that becomes even more powerful, supporting a strong voice, like ”Now Is The Time” and its opening that reminds us (like quite the whole album) of 80’s Heavy Metal albums from bands like Iron Maiden. Modern songs with references to the past. This catches us somewhere in time in a good way, during a time that is not wasted. In the same way, ”Slaves” is a powerful song, And it closes really well this album. “Never Not Again” offers a good tempo with good balance between instruments and vocals, and nice guitar sections, that make a unique song, to listen to again and again. And not only twice Something old? Something new…? Every song you can hear in this album is unique, but sharing a common old-fashion tone that make you feel well, like caught somewhere (back) in time, through a clever play of the music and a talented songwriting. So, this is a nice journey in music with different and delightful parts with different moods and flavours. You have to enjoy it as a good new sound with old references, that you could not imagine, even in your wildest dreams.